"Imaginative, practical and quite simply, essential for anyone getting started in hypnotherapy." 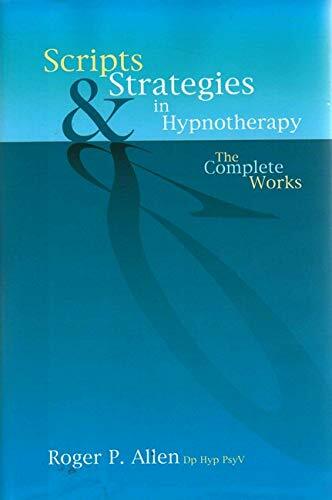 This book - or, to be more specific, this revised and updated compendium of Volumes I and II - is designed to be of assistance to all therapists as they unlock the possibilities that exist for their clients and help them make significant and beneficial changes to their perceptions and beliefs. Upon compiling it, Allen's ultimate aim was to provide practitioners with the best toolkit of strategies possible, replete with a variety of practical scripts to serve as the basis for their interventions, derived from his own experiences as a therapist. It covers inductions, deepeners and actual scripts for a wide range of cases; from nail biting to insomnia, sports performance to past life recall, speech difficulty to loss and bereavement, pain management to resolving sexual problems, and more.There is a particularly comprehensive section on smoking cessation, including a specimen questionnaire for use during the initial interview as well as useful content for a leaflet on the dangers of smoking to give to clients to take away with them following the session. All of the scripts can be used as they stand, or adapted as necessary for specific situations and for client-specific needs and concerns. Suitable for hypnotherapists of all levels of experience.